An on-site restaurant ocean views and beachfront perch are the prime perks guests find at the Surfer Beach Hotel where Wi-Fi is free. The four-story Surfer Beach Hotel is home to 52 rooms all with complimentary Wi-Fi flat-panel TVs and mini-fridges. 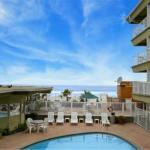 Non-smoking rooms are available and some rooms feature balconies with Pacific Ocean views. Guests help themselves to complimentary coffee in the lobby any time of the day. The heated outdoor pool is a welcome amenity when the sun's shining. Guests with work in tow are happy to know the hotel offers fax and copy services. The in-house restaurant serves contemporary regional cuisine. Pets are permitted for a fee and parking is available for an additional charge. The beachfront hotel is two miles from Kendall-Frost Mission Bay Marsh Reserve and three miles from Mission Bay Golf Course. It's five miles from SeaWorld San Diego. The University of San Diego is seven-and-a-half miles away and the San Diego Zoo is 11 miles away. The hotel is nine miles from San Diego International Airport.